Oranges are the only fruit! Communication. What with the books, phones, email and the world wide web, communication of information is easy. Yet it is surprising how some facts and figures, some well known local traditions and customs can fall below the radar. The orange giving ceremony is one such custom. Look for it in a book and you will not find it! Indeed, I found it difficult finding exactly when it happened. It said 10.30 on the Round Table website. I emailed them. No reply. Communication you see! So I arrived early. It was 11 am it happened for future note. What happened? 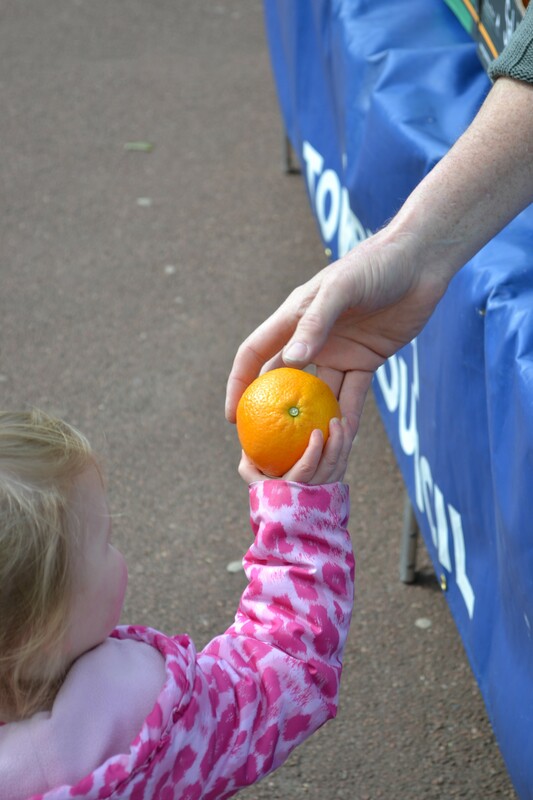 Well every Easter Monday the local town council appear at Carlisle Park and distribute oranges to all the children they can. Afterwards a range of egg themed sports from the very familiar egg and spoon race to egg rolling and jarping were planned. I was told that one year, a group of young teenagers got cocky in an egg passing competition and when it was their turn the hard boiled was replaced with a raw one to hilarious results! The start of many oranges! Unlike many food giving customs, there does not appear to be an associated benefactor or name associated to the custom. Apparently, the local gentry and town’s folk were concerned about the children’s lack of fresh fruit and decided to provide some for free. This is said to have happened in the 17th century. It makes sense oranges had become a popular fruit around this time but I find it odd that there is no record of exactly why! Perhaps it was because the town wanted to show support for William of Orange or someone acquired a job lot. The custom appears to have been undertaken on a site significantly called Easter fields to the north-east of the town. A record of the custom is recorded in Hist BNC XIV 129 which suggests young people resorted to the North field to play ball and other games. The distribution moved apparently in the 1970s when it was realized that children preferred Carlisle Park…as there were swings. Presently four boxes of oranges arrived, good quality round and juicy navels, a good handful for any young child. I calculated just under 600 oranges. It was a lot to give out, but already as the tables were set up under the Easter Orange special banner, small groups were assembling. Many looked keen. The group of councillors waited for the Mayor, as it got later and later, it looked unlikely they would appear. Perhaps there had been a breakdown in communication? 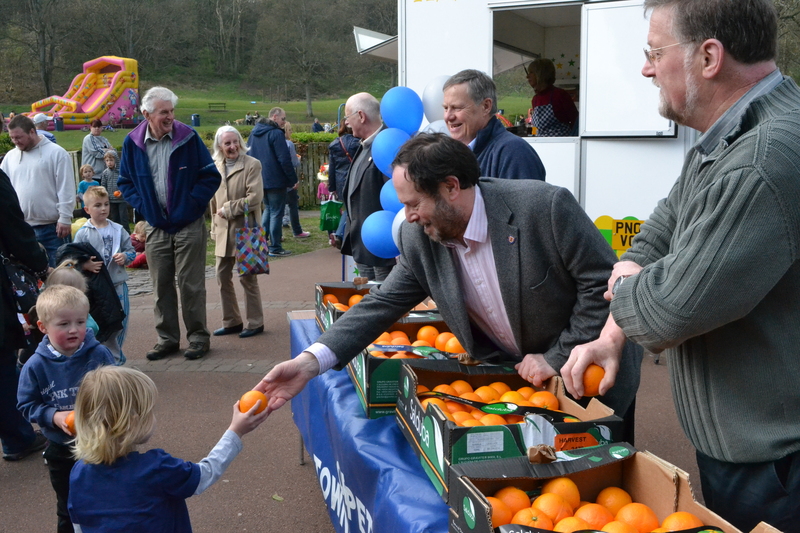 So as there was no sign of the Mayor, so at 11 as promised the deputy mayor opened proceedings with a quick speak about the origins of the custom…and no sooner had he finished than a small toddler rushed up to grab an orange. 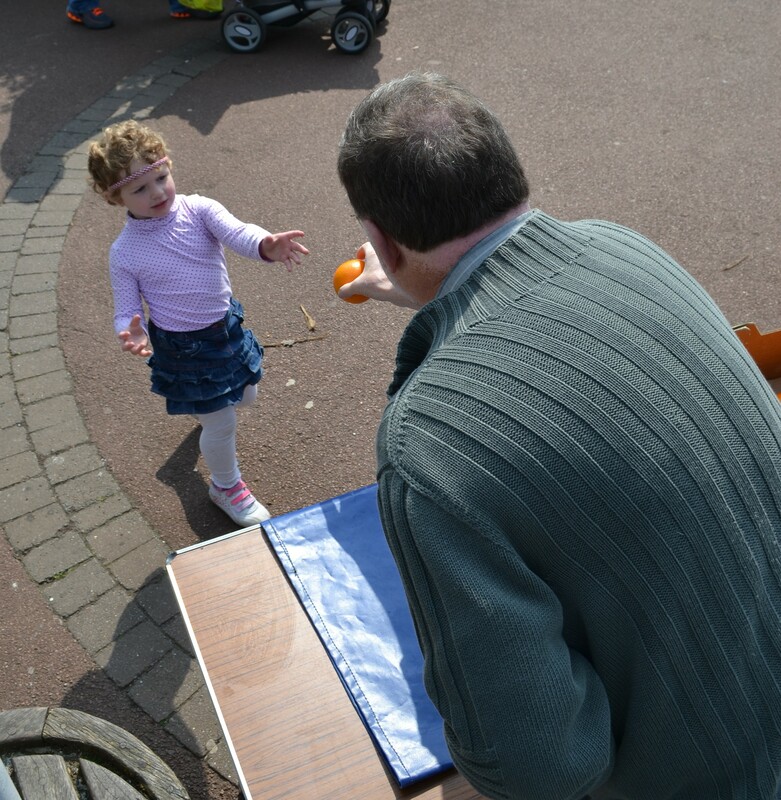 He was the first of many, for at least 20 minutes the distribution was fast and furious with all hands on the oranges! After about thirty minutes the crowd had dispersed. Don’t keep jaapin’ on about it. After and during the orange distribution, the local Round Table provided traditional Easter games, egg rolling or boolin’ and jaapin’ but they were nowhere to be seen! Many of the children and a fair few adults weren’t happy about this. But despite no organisation some had brought eggs and nothing was going to stop them boolin’ them! 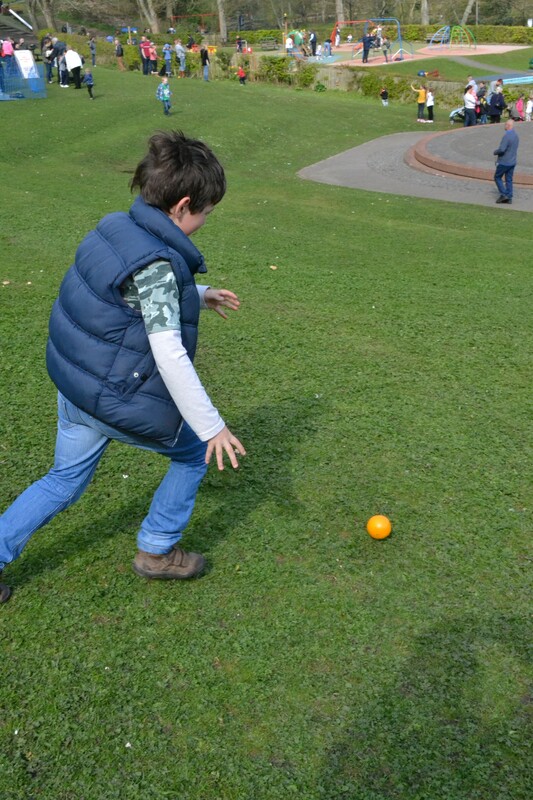 The hillside behind the playground was covered by children throwing and rolling eggs and oranges. I did not see any jaapin, hitting another’s eggs with yours, a sport akin to conkers. The other children seemed content with the bouncy castle provided, which was a good compromise but not really in spirit with the day perhaps. After the Easter Sunday excesses of chocolate, I am sure a nice refreshing orange was a great antidote. Many of the parents thought so…less so the children, some of which seemed perplexed by the large orange spherical objects being passed out. Interestingly, it is worth noting that what with recent news about the need to increase 5 to 7 a day, a dose of orange is what the doctor ordered. Those forefathers got it right. Then at 12.40 the last orange was given out. It was over for another year. Still no mayor. I wonder what communication was passed on to them? Calendar Customs …its not on there yet, but it is always on Easter Monday at 11.